Bob and Gage Little, owners of G. Little Construction, have been selected by REMODELING magazine to join the REMODELING Big50. 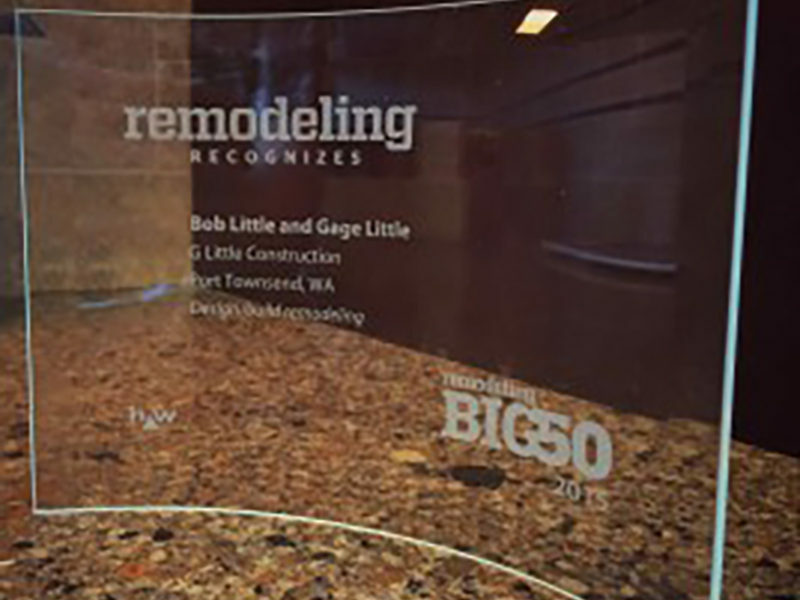 As a Big50 winners, G. Little Construction was featured in the May issue of REMODELING. Each year since 1986, the REMODELING Big50 inducts 50 owners of remodeling companies that have set exceptionally high standards. REMODELING considers professionalism and integrity through exemplary business practices, craftsmanship, and impact in their community or the industry at large. Big50 remodelers run successful, often growing, companies of various sizes that have taken the lead in raising industry standards. The uniques structure of the company is one of the reasons G. Little Construction won the award, says Bob Little. Every job has a lead carpenter who communicates directly with the customer and office staff. Active communication allows the customer to remain knowledgeable about the progress of their project. Customers also have the comfort of knowing when to expect someone on their job site, and when work will be done off-site, such as creating countertops. Bob Little credits insight gathered from participating in Guild Customer surveys as a catalyst in being able to raise the service of G. Little Construction to a level worthy of the Big50 award.